We provide a range of free wheel fitment guides (charts) for different vehicle manufacturers to help you determine which wheels and tyres will fit your vehicle. As well as our wheel fitting charts we also provide a web configurator, which displays compatible wheels and tyres once you have selected your vehicle's make and model. Our fitment guides contain wheel sizes and technical data against each vehicle model. These are typically the range of wheel sizes that would have been available to order with your vehicle from the factory – either as standard or as an option. Our charts include technical data like wheel width, diameter, wheel offset, PCD and tyre sizes. You can use these guides to determine which wheels will fit your vehicle or which tyres will fit your existing wheels. Please note; some vehicles may have front and rear wheels that differ in size and where this is the case information has been detailed on the charts. Wheels have four different measurements: Width, diameter, PCD (also known as pitch circle diameter or Stud Pattern), and wheel offset. The wheel diameter and width are the most commonly quoted measurements when buying wheels. Traditionally measured in inches, you will see measurements like 18x8 on our fitting charts and also on our website - this means that the wheels are 18" in diameter and 8" wide. Sometimes you will also see a letter quoted after the width and it is not uncommon to see this stamped on wheels. This letter denotes the shape of the wheel where the bead of the rim meets the tyre. The most common profile is 'J' e.g 18J, although some 4x4s may have a bead profile of JJ. Older vehicles can have bead profiles like K, B, or P.
The Pitch Circle Diameter (also known as the stud pattern or bolt circle) is determined by the number of wheel bolts that are used on each wheel and the diameter of the imaginary circle that passes through the centre of each bolt. A good example of a PCD is the MK3 Audi A3, which has a PCD of 5x112. This means each wheel has 5 bolts, and an imaginary circle passing through the centre of each bolt would be 112mm in diameter. Please note: Oour fitting charts are simple free guides provided without warranty - We do not guarantee the accuracy or completeness of the data on these charts. 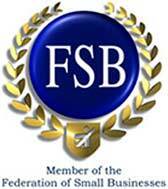 If you are aware of any errors or omissions on any of the fitment guides, please email us. The wheel offset determines where your wheels sit in relation to the wheel arch and is measured in millimeters - sometimes quoted as 'ET', for example 'ET 45'. 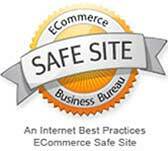 Each vehicle has a recommended offset range and this is different from vehicle to vehicle. Simply put the offset is a measurement from the centre of the wheel to the wheel's mounting point. 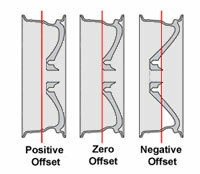 The offset will either be positive, negative or neutral. A wheel with a positive offset has a mounting point nearer the road and will wrap more deeply around the hub and brake mechanism, whilst a wheel with a negative offset will sit in a more shallow position. If you look at the diagram you can see the difference between each wheel offset as viewed head on. Our fitting charts / fitment guides display factory fitted wheel sizes, so any offsets quoted on our charts are within manufacturer's recommendations. Fitting wheels with an incorrect offset can be dangerous and can cause a number of different problems. It may cause the wheels to rub against the suspension or bodywork and affect handling, either making the steering too heavy or too light. It is therefore essential to ensure that any wheels you fit have an offset that matches the manufacturer's recommendations. On the sidewall of every tyre there are a series of numbers and letters and these represent the tyre's specification in terms of both its physical dimensions and the tolerances it has been designed to withstand. Tyre Width: The tyre width is the first number you'll see on the tyre. This usually appears as a marking like 255/35 – 255 is the width of the tyre in millimeters. Tyre Profile: The tyre profile is the second number on the tyre. It represents the height of the tyre as a percentage of the width. 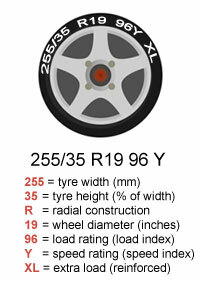 For instance a tyre marked 255/35 has a tyre height that is 35% of 255mm. Wheel Construction: Most modern tyres are marked with an 'R', which indicates that they are of radial construction. Wheel Diameter: This is the diameter of the wheel that the tyre is designed to fit in inches (and therefore the diameter of the inner rim). In the example above the tyre will fit a 19" wheel. Load Index: Each tyre has a load index (sometimes referred to as a load rating) and it is displayed together with the tyre's speed rating. In our example we see 96Y – this means the load index is 96 (Y is the speed rating). A load index of 96 tells us that the maximum weight per tyre is 710kgs. Speed Rating (speed index): the letter after the load index indicates the speed rating of the tyre. In this example, 96Y, the Y indicates that the tyre is designed to travel up to 186mph with the corresponding load. Typical speed ratings include: W (168mph), VR (131mph), V (149mph), ZR (149mph), H (131mph) and T (118mph). Occasionally you will see another set of letters after the load and speed rating. In our example XL simply means that the tyre has been designed for extra load. These are essentially reinforced tyres designed to carry heavier cars and can often be found on cars with lower tyre profiles. For information on tyre pressures please check out our tyre pressure page.